Every once in awhile comes along a special politico who telegraphs his love of country more than obeisance to his Party. A person who knows that he or she is a servant, not a dictator to the entity that is the center of this Representative Democracy: The Individual. Those kind of people can fill a thimble. Michele Bachmann, Ted Cruz, Marco Rubio (most of the time), most any military Veteran in office, Ronald Reagan and Scott Walker come to mind. What do these people have in common? They’ve always kept their eye on the needs of the country and resisted the feints by adversaries to change the subject to the latest political fad. They know the difference between the “want-tos” and the “have tos.” They’ve kept their eyes on the priorities of government, or, as Coach Pat Riley might say, they know that The Main Thing is the Main Thing. For those of you who wonder how one becomes that kind of politico, I would direct you to one single phrase, “I trust you”. We can’t exist as a sovereign nation unless we trust our next door neighbor. We all know people who shouldn’t be trusted, but the majority of the folks we know are at least as trustworthy as you used to be. Instead of what the government statists assume of us—we’re too stupid to run our own lives—we should embrace the idea that we should encourage people to trust themselves because the rest of us are depending on them. I often tell my kids when they are afraid of taking a step out into the arena that they ‘should fake it till they make it’ because EVERYONE is timid about growing up. Everyone. I tell them to act like you know what’s up, be humble and willing to learn and you’ll figure it out. Why do we not assume most grown up Americans can do the same? A California man driving in Fresno used his iPhone 4 traffic app to navigate around a traffic jam. He was given a $160 ticket for using his cell phone while driving (he was stopped at the time). The U.S. Supreme Court recently ruled in the Proposition 8 case that citizens may have the power of the initiative in many states, but they don’t have standing to fight for it in court. New York Mayor Michael Bloomberg got the idea that it was his job to be the P.E. monitor for Masters of the Universe and janitors alike. Oregon recently passed a law that says parents can’t smoke in their own cars if there are children present. President Obama is spying on us—and reporters. An NFL player is arrested for—fireworks possession. Everywhere you look there are examples of government apparatchiks who think they’re smarter than we are just because they’re, well, government apparatchiks. What is going on? I’ll tell you what’s going on, they don’t trust us. Now instead of driving this column into the government-is-too-big polemic, which of course is true, let’s consider this to be an opening for the conservatives to trust the people. Hey, Republicans, don’t tell people we’ll take care of you. Tell Americans we’ll trust you. It’s easy to be Democrat-lite, but it’s much harder and more honest to say, we trust you to do the right thing for yourself and our country. We trust that you know how to feed your own child. If you can’t, we’re here for you, but if you can, stop depending on everyone else to do it for you. We trust you to drive your car safely. We trust you to buy your own health insurance. We know if you’re smart enough to buy your own data plan for your cell phone and pick out your whether you want Game of Thrones or the Food Channel on cable so you’re smart enough to figure out what health coverage you need. We know you’re smart enough to know that your local school isn’t working for your kid and you should be able to choose another one. We trust you to drop a dime on taggers and gangsters who predate upon your children and will help the cops defeat them. WE TRUST YOU. It’s all you have to give, frankly. You can’t keep giving everyone else’s fruits away. That is a message that can win elections and reign in government. Now, can we trust you electeds to do this? 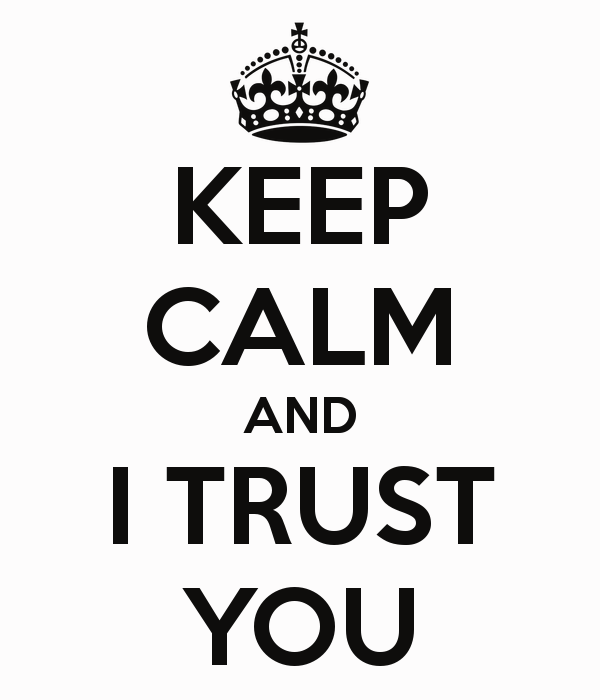 We trust you when you trust us. If you can’t, we have lost our country.